You are more than just a corporate creature, and your LinkedIn profile should reflect that. There are causes that you care about and support after work hours. Showing your philanthropic and humanitarian interests proves you are a well-rounded individual, which readers of your LinkedIn profile may find interesting and relatable. Do you belong to a service organization such as Rotary, Kiwanis, Knights of Columbus, Shriners, or Lions Club? Do you donate to the Salvation Army, Toys for Tots, Doctors Without Borders, UNICEF, or St Jude Children’s Hospital? Do you take part in the Susan B. Komen Race for a Cure or have donated time to a charitable organization? Individual experiences allow you to showcase the breadth of your work. You can add the name of the organization, your role, the cause it supports, dates of your tenure, and a description. You can also list just the organizations you support, but don’t necessarily work one on one with them. LinkedIn enables you to select whether you want to donate time or talent to future nonprofit charities. You can also select from a list the causes you hold dear. If you have the Volunteer section already added to your profile, simply scroll to it and click the pencil (edit) icon to enter into edit mode, then go to Step 5. If you don’t have the Volunteer section added to your profile yet, scroll below the Contact Information section at the top part of your profile and click the View More link to see a full list of sections to add. In the Volunteering Experience section, click Add Volunteer Experience. When clicked, the Volunteer section appears on your profile. Type the name of the Organization in the Organization field. Click Role and add your role or the type of volunteer work you do. This field shows at the top of the individual volunteer experience; it should spotlight either your role or what you are doing specifically. Here are some roles that might work for you: Angel, Backer, Contributor, Supporter, Patron, Donor, Grantor, Giver, Sponsor, Subscriber. Click the Cause drop-down list and choose the applicable cause from the list. If nothing from the list correctly identifies this volunteer experience, choose the top option that looks like a minus sign to leave this field blank. In the Date Range fields, choose the month and year from the drop-down lists. LinkedIn defaults to present with no end date. If this Volunteer experience is no longer current, enter an end date by deselecting, I Currently Volunteer Here. 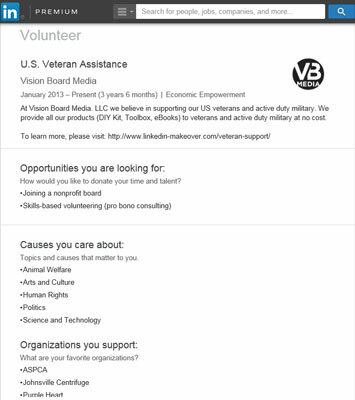 In the Description field, enter information about the volunteer experience. It’s better to add context around your experiences and the easiest way to do it is to visit the organization’s About Us page on its website. Scroll down and hover your mouse pointer over the Opportunities You Are Looking For area and click the pencil (edit) icon to enter into edit mode. If you would like to be considered for a nonprofit board or if you would like to offer your skills for free to a nonprofit in need of your specialty, click the boxes to select. Scroll down and hover your mouse pointer over the Causes You Care About and click the pencil (edit) icon to enter into edit mode. Select the causes you care about by clicking the boxes. Under Which Organization(s) Do You Support, enter any additional charitable organizations you would like listed on your profile. The charitable organizations to add are those that you are not actively donating time. Click inside the text field and begin typing. LinkedIn tries to match the organization you are typing with one that already has a page on LinkedIn. Click the option from the drop-down list or add it free-form if no match is available. To add multiple organizations, press the Tab or Return keys. To add additional volunteer experiences, Click Add Volunteer Experience and lather, rinse, repeat.